In the browser war, the trio Firefox, Chrome and Internet Explorer try to sort out which one amongst them is “the good”, which one is “the bad” or which one is “the ugly”. For Open Source lovers and web designers, it is rather easy to say which one is “the bad” one. In some cases all three could be good or not just good enough. So I switch my browsers according to my needs. When it comes to social networking in general and Facebook in particular, I give it up to Flock. 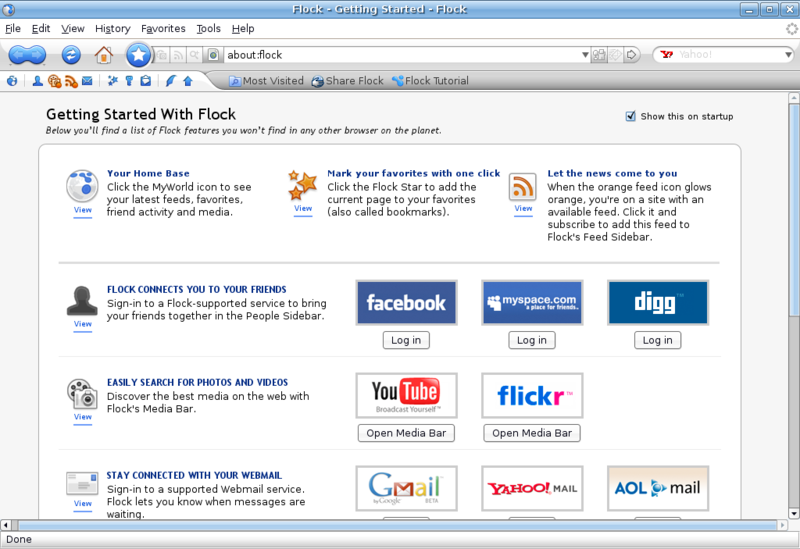 Flock is an award winning social web browser and CNET Download.com five-star-rated browser. It is built on Mozilla Firefox – Flock version 2.0 is built on Firefox 3 and it pack-ups goody support for MySpace and Media RSS. Added to those already present for Facebook, Digg, Youtube, Flickr, WordPress, Gmail, Blogger, Picasa etc makes Flock a social-web-focused browser. This how Flock looks when I log into Facebook. The Flock sidebar rocks; it’s the magic in Flock. Clicking on the People Sidebar button displays your Facebook account on the top left and that of your contacts immediately below. It makes it so easy to run through your contacts. A click on your contacts avatar takes you to his/her “Wall”. A click on Media below your contacts avatar open up the Media Stream. Wow. So you really don’t have to move over to your friends profile to view his/her pictures. You could be like on “Marks” profile and viewing photos on Anthony’s profile. The Media bar also provides a multiple search engine. You can search for video on YouTube, images on Flickr, Picasa, PhotoBucket etc. The Photo Uploader permits you to quickly tag, crop, rotate, describe and upload photos to your profile. The Web Clipboard completes the opera. Drag ‘n’ Drop text, links and images on your clipboard for further or future consultation. You can as well, blog your clipped object right from there or send it to a friend via email. Flock like Firefox has extension. You can get more search engines for Flock or Clikball extend-it. OpenID (single digital classentity across the Internet) users also have an extension. If Facebook pledges support for OpenID [TechCrunch], then why not you? – In Windows, it’s a simple and direct install. As the proverb goes “BIRDS OF THE SAME FEATHERS FLOCK TOGETHER”.